Hoarfrost have been on the dark ambient scene for a few years. There work has definitely moved some eyebrows in the past. But, this time around Hoarfrost have delivered an album which has been receiving an abundance of praise. Released on Reverse Alignment and accompanied by a brilliantly well done music video, their latest album Anima Mundi appears to be a career defining moment. I caught up with Rafał Kopeć, the main artist behind Hoarfrost to ask him some questions about the album and the history of his project. Rafał: Hoarfrost was born in the end of 2006. The first CD, Ground Zero, was released in 2008 by the big Polish label Zoharum. Next CDs by Hoarfrost: collaboration with Inner Vision Laboratory entitled Decline and album Puppets Of Divine Coroner, also appeared on this label. 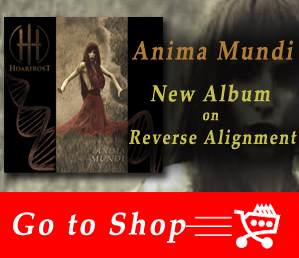 After a few years of Hoarfrost’s absence on the music market, a brand new album entitled Anima Mundi, was released on August by Swedish label Reverse Alignment. Michael: The music video for „Refracted In Illusion” turned out very well. Could you tell us a bit about the concept behind this video, and how it came to happen? Rafał: I am looking at the album as a completeness, which has its beginning, developed view and the ending. Each track is an element of a jigsaw puzzle which has to match to another. So I couldn’t point one favorite track. Anima Mundi is for me one 50-minutes composition. Rafał: It is a very difficult question, because I have always listened to many different genres of music. My first fascination was with punk rock, next there were metal, sung poetry, new wave, but, anyway, I never was interested in electronic music. At present, I also listen to many genres and many artists. The music, which I listen to, should have „something” which makes me go back to it again and again. Michael: Many artists have specific rituals that take place in their studios. Whether it is a type of incense, meditation, midnight sessions, etc. Do you have any rituals/customs like this which you incorporate into your recording sessions? Rafał: Before I sit down to make sounds, first I try to ex-cogitate and prepare everything in my head. It help me go into some kind of trance. When I lose my inspiration during the work, I try to give my attention to other music. In this way I have made the album of my other project, Arbeit, which I composed while working on Ground Zero. Currently, in moments like this, I take my guitar and I play for a few minutes, trying to relax. I like to work with headphones in darkness and loneliness, because in this way I can be alone with the sound. Rafał: When I release the album, I don’t plan next material. There should pass some time, so I can give it some distance. Each album is a separate message. It can’t be random. The music is an addiction. Releasing new album gives a satisfaction for some time. Later the requirement of creating comes again. Michael: I like to ask everyone this question in my interviews. Do you think the apocalypse is coming? If so how do you think it will happen?